Lately, I’ve been working pretty hard. My day job has been keeping me very busy. (Not that I’m complaining, mind you. I’d rather be busy than sitting with nothing to do.) Then, after getting the kids into bed, I’ve been busy with a rather large freelance project. After all of that work, I need to unwind and relax somehow. Lately, my method of choice has been playing Lego Marvel Super Heroes for the Wii U. I’ve been a fan of the Lego games for awhile on the Nintendo DS, but this is the first Wii U title I’ve tried. A full review is still coming, but suffice it to say that I love it. One of the things I’ve always liked about Lego games is the replay-ability. After finishing all of the levels, you could always play them again in "Free Play" mode. This title has that, but also has all of Manhattan to explore. 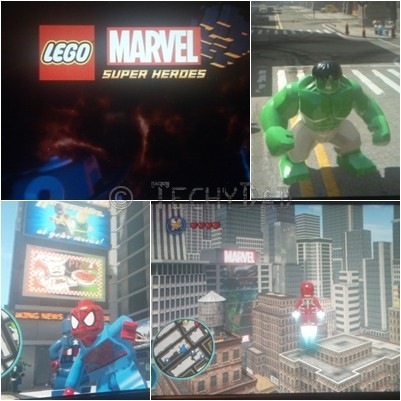 There are gold bricks to collect (over 200), citizens to help, Deadpool missions to complete, vehicles and characters to unlock, and Stan Lee to save (many, many times). It’s quite daunting how big the world you get to play in is, but it’s also quite fun. Now, if you’ll excuse me, I need to go flying around the city as Iron Man. Or maybe go on a rampage through the streets as the Hulk. TechyDad Smash! NOTE: We purchased Lego Marvel Super Heroes on our own. I wasn’t asked or paid to do a review. I just wanted to mention a product that I liked. Soon after The Hub network premiered here, NHL discovered Family Game Night. This game show showed two families competing for cash and other prizes by playing modified versions of classic games such as Scrabble, Connect Four, Yatzee and Sorry. NHL quickly grew to love the show and insisted that we record each and every new episode. He would excitedly root for a favorite team and developed favorite games. 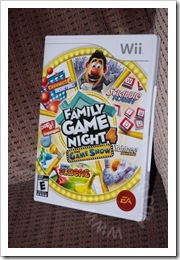 Meanwhile, NHL loved playing games on the Wii including one of the Family Game Night series that we had purchased. 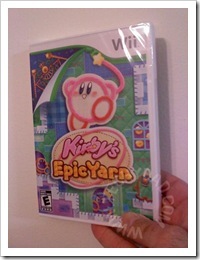 He really loved the idea of taking a board game and playing it in video game format. Combine the two and you get Family Game Night 4: The Game Show. There are two modes to this game. The first is a one or two player version of the Family Game Night TV game show complete with announcer Todd Newton assisted by Mr. Potato Head. In this version, players compete in versions of the Family Game Night TV show’s mini-games. Winning players get Monopoly cash cards. At the end of the game, you see just how much those cards were worth. The player with the most Monopoly cash wins. In the other mode, players can play the individual mini-games either against another player or against the computer. 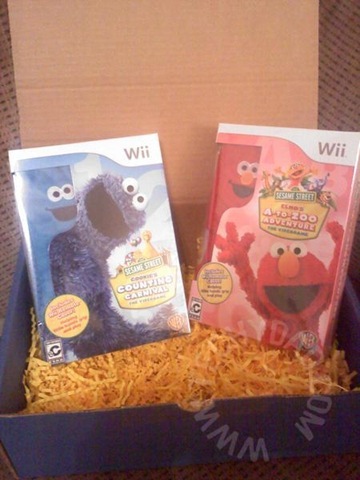 There are also slightly altered versions of the games. For example, Sorry Sliders becomes Sumo Sliders. Instead of merely sliding your Sorry sliders shuffleboard style and worrying about other sliders, you also need to worry about some big (aka Sumo) non-player sliders that are already on the board. Just to keep things interesting, you can win trophies for completing various activities (like getting 4 in a row in Connect 4 Basketball in only 4 shots). 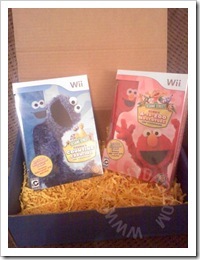 Though they were a bit much for JSL (age 4), NHL (age 8) and I loved playing both the game show and individual games. This is definitely a game that we will be playing over and over again. 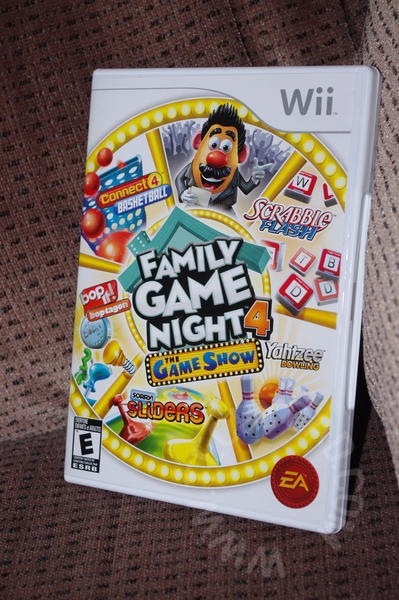 Disclaimer: I received a copy of Family Game Night for the Wii from EA Play. No other compensation was given and no review expected. The opinions stated above are my own. “Snoopy” was my mother. That 121 score? That was JSL! 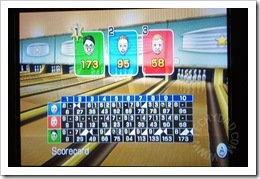 He was rocking the virtual bowling alley with two strikes and three spares. 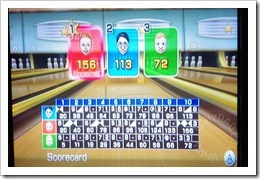 He even beat his older brother (who came in with a not-too-shabby 113). Ok, this sounds bad, but it really isn’t. 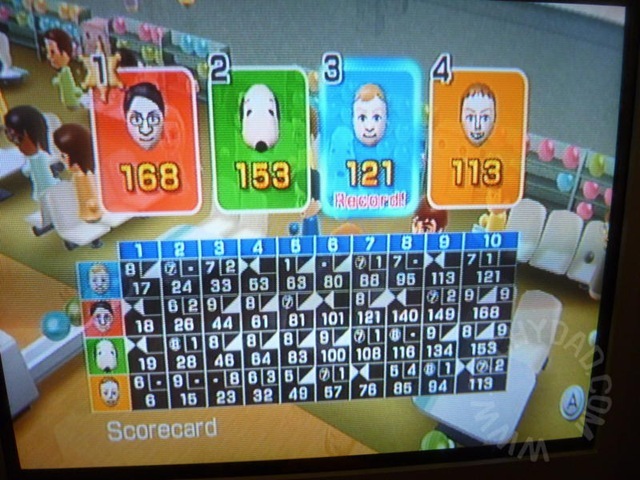 After Wii Bowling was done, we loaded Wii Boxing and I handed the Wiimote to my dad. Then, he and I duked it out. 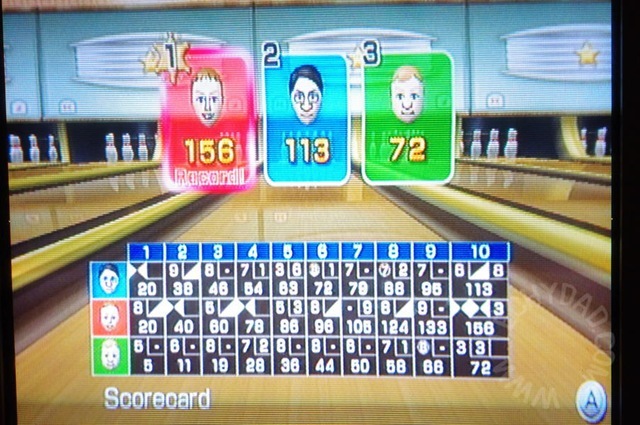 I won, but he got some good punches in. I don’t think he expected a simple video game to give his arms such a workout. After coming back from lunch (and some shopping), we went back to my house. Killing time before I had to start dinner, I put Toy Story Mania into the Wii. This time, NHL, my father and I played. We all had fun playing the various Toy Story-based carnival games. 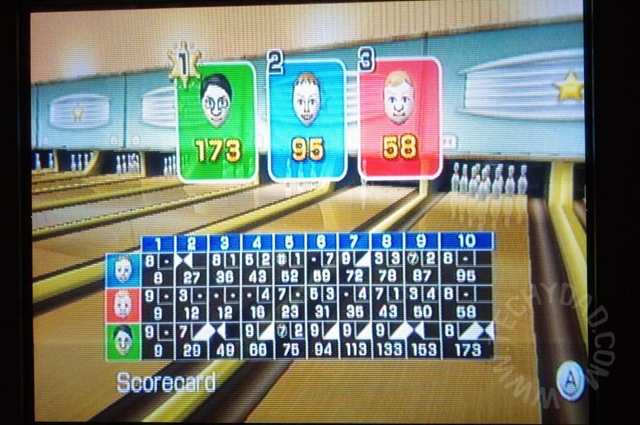 For the record, I won easily. Got nearly my father’s and NHL’s score combined. Part of that was probably because, due to a quirk in the game, I got to play solo in a lot of games. This gave me exclusive access to the point generating activities instead of sharing them with another player. My mother mentioned that she wanted to learn how to knit a scarf. I pointed out that B has knitted a few. At the time, she was in the middle of two scarf-knitting projects. While the boys, my dad and I occupied ourselves with other activities, my wife and mother bonded over knit-pearl. I wanted to show my parents my cooking skills. I didn’t actually wind up getting the chance to do this. Instead, we went to BJ’s and bought frozen/refrigerated dishes to heat up and serve. Still, eating dinner at home with my parents versus in a restaurant was a nice experience. I showed my parents the Cake Wrecks book and they kept laughing. When I left it on the table to check on dinner, I saw them flipping through the pages laughing at all of the mangled cakes. I need to remember to e-mail them the URL for the Cake Wrecks blog. We stopped by the new Fluffalicious store and got some delicious cupcakes for dessert. 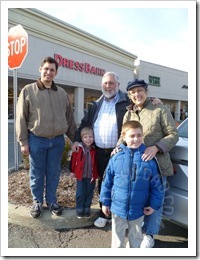 It was quite the yummy stop to make (and one I think we’ll be making quite a few more times in the near future). 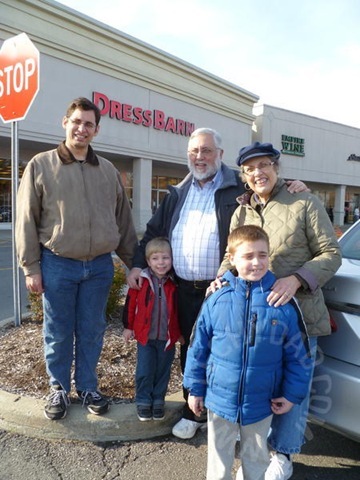 I miss my parents already and hope we get to see them again sometime soon. These arrived yesterday and will likely consume my weekend. 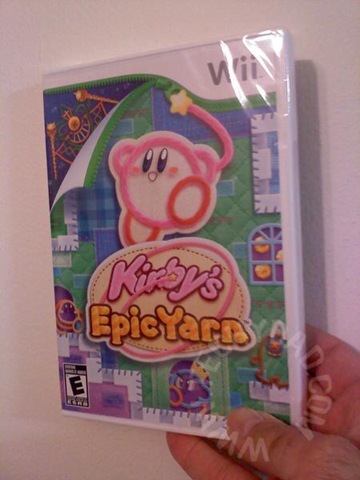 I’ve already played a bit of Kirby’s Epic Yarn and I’m hooked. The others? 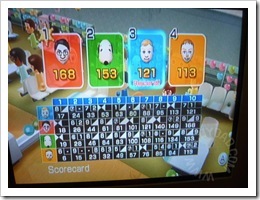 JSL and NHL are going to fight me for control of the Wii. Meanwhile, B will silently shake her head.